Smoothies and juices were posted all over the internet at the start of the new year as healthy meal substitutions. I love smoothies, but there has to be enough substance in them for me to feel full! Otherwise, I have a smoothie and end up snacking on another meal’s worth of calories over the next few hours. Adding veggies instead of only fruit bulks up on the fullness factor (and fiber) and cuts way back on the sugar of a standard store bought smoothie. Beware of purchasing smoothies in shops and grocery stores, and don’t be afraid to ask for real fruit instead of juices or frozen fruit in syrup. Yuck. This smoothies adds veggies to breakfast which is very unusual for me and fills me up to start the day! 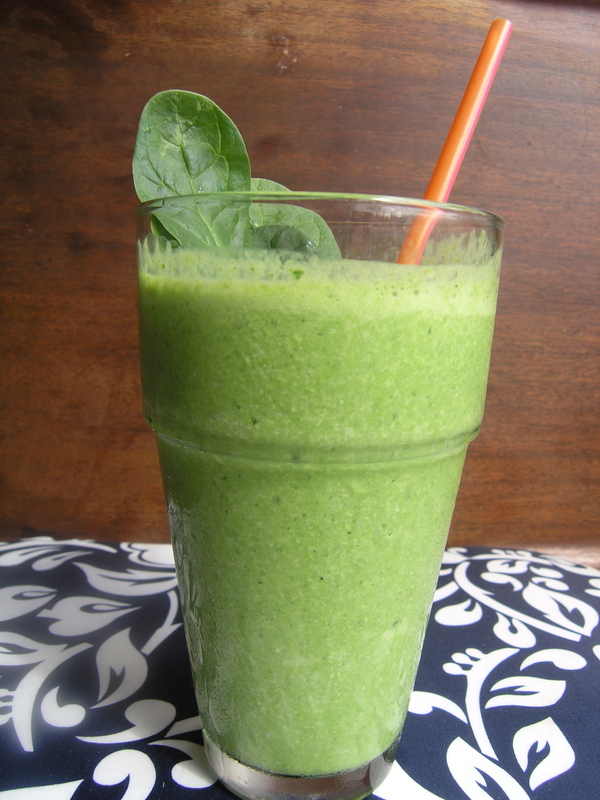 Put the spinach, banana, yogurt, and milk in a blender. Pulse and eventually place on blend setting until the mix is completely blended. Add ice cubes and pulse on ice grate setting until the mixture is smoothie consistency.